Dr Ulrich Eichhorn was born in 1961 in Obernburg. He studied mechanical engineering at the Technical University in Darmstadt, completing his studies with a doctoral degree. From 1993 to 2000, he worked at Ford in Germany, the USA, and the UK, and was responsible for Vehicle Dynamics Development and Overall Vehicle. 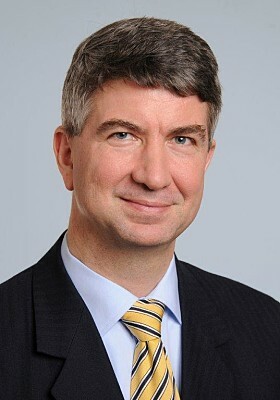 In 2000, Dr Eichhorn joined the Volkswagen Group and headed Volkswagen’s Group Research division before moving to Bentley Motors in Crewe, England, in 2003 to become the Board of Management Member responsible for Development. In 2012, he took over management of the Technology and Environment department at the German Automotive Industry Association (VDA) in Berlin. Dr Ulrich Eichhorn has been working as head of Group Research and Development at Volkswagen AG since April 2016 and reports directly to the Chairman of the Board of Management, Matthias Müller. The Volkswagen Group with its headquarters in Wolfsburg is one of the world's leading automobile manufacturers and the largest carmaker in Europe. In 2009, the Group increased the number of vehicles delivered to customers to 6.336 million (2008: 6.257 million), corresponding to a 11.3 percent share of the world passenger car market. In Western Europe, the largest car market in the world, just over one in five new cars (20.9 percent) comes from the Volkswagen Group. Group sales came in 2009 to 105.2 billion euros (2008: 113.8 billion). Profit after tax in the 2009 financial year amounted to 0.9 billion euros (2008: 4.69 billion). The Group is made up of nine brands from seven European countries: Volkswagen, Audi, SEAT, Skoda, Volkswagen Commercial Vehicles, Bentley, Bugatti, Lamborghini and Scania. Each brand has its own character and operates as an independent entity on the market. The product range extends from low-consumption small cars to luxury class vehicles. In the commercial vehicle sector, the product offering spans pick ups, busses and heavy trucks. 370,000 employees produce about 26,000 vehicles or are involved in vehicle-related services each working day. The Volkswagen Group sells its vehicles in 153 countries. It is the goal of the Group to offer attractive, safe and environmentally sound vehicles which are competitive on an increasingly tough market and which set world standards in their respective classes.